Do you have anything that you wish you would just go away…some extra pounds, a toxic relationship, a debt, or other nuisance? Consider using the changing of the se asons to aid you in making long overdue life changes. As the leaves fall and turn different colors, you can let things go that no longer serve you. Don’t wait until the New Year when now is a powerful time energetically for transformation. Metaphors are potent for putting things in perspective. For example, visualize a backpack full of all the extra things that you no longer want to carry around. What are they? Be specific about what you want to let go of or change. Now put the backpack on and feel the weight of it on your back and how much it weighs you down, makes you feel sluggish, and/or adds anxiety. Now put the backpack down! You are lighter and more carefree. Why have you been carrying it around? How has it been serving you? People don’t do things that don’t serve them on some level, so figure out how these things have served you in the past at low levels or in unhealthy ways. What are the consequences if you keep carrying the backpack around? How can you get rid of the backpack…drop it off a cliff, send it to outer space, explode it into a million pieces? 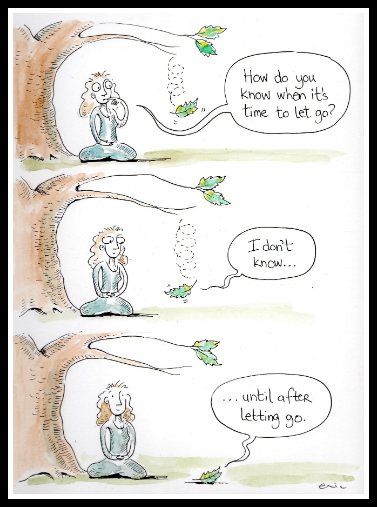 Image it gone, and breathe a sigh of relief as a result of your decision to let it go. If letting go creates a void, list any and all ideas you have for activities or other ways to get the same needs met at higher levels. For me, when I get stressed or bored, I find myself staring into the refrigerator to eat mindlessly. Instead, now I pre-schedule ways to manage stress through exercise and plan for a nourishing protein shake right after my workout to feed my muscles and not my emotions. On a daily basis, it’s not fun for me to exercise alone because I’ve identified that I’m a social exerciser. Because of this, I line up workout buddies at scheduled times to make sure I stay accountable and enjoy the process. As we exercise we also attempt to solve the worlds problems (ya right!) so it can also be therapeutic. Fall is a good time to identify the things you want to let go, forgive, and heal in order to grow and move to the next level.